Guitar lessons Meath was founded in 2010, born out of a desire to develop the whole student and not just their musical style or attributes, but also their character and confidence. It is a universally accepted belief that music develops every aspect of the player’s personality. Guitar Lessons Meath are student focused, and their ethos is to teach with musical understanding, to help students develop and understand what they play. Understanding what is being played develops the confidence and agility to play with other musicians. Having music is a gift that is as individual as we are ourselves, performing music enables an individual to deal with positive stress, take risks, and overcome. Our Guitar lessons promote fast development and understanding whilst keeping interest alive, by utilising an all-visual approach to teaching, focusing on “Musicianship First” rather than the traditional approach of performing set pieces. Our courses are based around minimal chord charts teaching students to accompaniment and lead parts associated to each chord set. This is then applied to contemporary song learning; as students chord vocabulary are developed, so does their understanding of what is being played. All styles of playing are developed. At Guitar Lessons Meath we teach students how to visualise the fret-board – not as one complete unit; but as a series of connecting and organised system of shapes and formulas. A visual approach can be applied to all instruments; the guitar however is particularly suited to this approach, due to its graph like construction of strings and frets. Just think of the very first chords you will learn on guitar it is the shape of those chords that are most memorable, and it is the shape that you call to mind when playing again. The main advantage of this approach is student quickly start to see reference and anchor points that take the guess work out of playing connecting these blocks then allows the student to navigate their way around the complete fret-board with expertise and ease and so rapidly increases your playing ability. This is an approach that has been adopted by the UK London College Of Music and is seen as the most beneficial and enjoyable way to teach music. It is now being adopted to all Instruments having being proven to speed and promote progress. Enabling students to think for themselves, and opening the way to improvise, right from the earliest stages to the advanced. 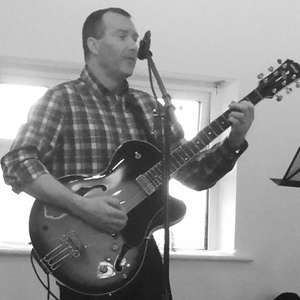 At Guitar Lessons Meath we have adapted an holistic approach to teaching guitar. Combining applied theory with a balance of practical examples, thus helping students to understand what they are playing. We provide graded or non-graded lessons. Our graded lessons are based on the Registry of Guitar Tutors curriculum with full accreditation and examination syllabus. Our lessons are student focused, and are more about the needs of each individual student than completing a set curriculum. Robert has been playing guitar for over 40 years, and is passionate about teaching and imparting the gift of music to his students. If you have any queries please fill in a request on our contact page and we will try to assist you.